BATMAN #64 begins a two-issue Batman/Flash crossover, tying in to Tom King's ongoing HEROES IN CRISIS limited series. It's a well done chapter, though the visuals can be a little overly-energetic for the nature of the story. How do heroes keep moving when they can’t protect those closest to them? How do you reassure people things will be okay when you don’t know for certain they will? Batman #64 sees the Caped Crusader grapple with these questions, and the trauma they drag up. Batman is consumed by guilt as the trail of clues runs cold at Sanctuary (see the Heroes in Crisis event). 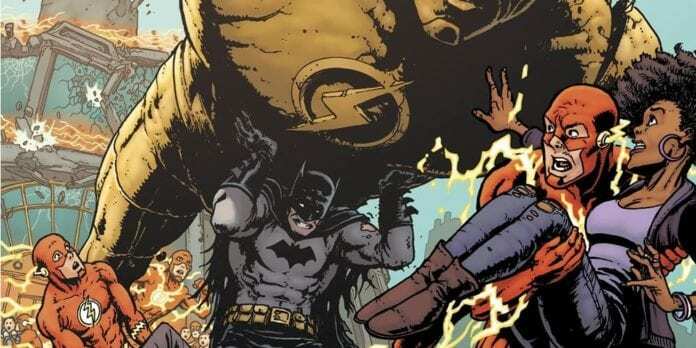 The Justice League’s strenuous schedule wears on him as he endures symptoms of PTSD. A surprise attack on the Flash Museum, though, brings Bruce and Barry Allen into conflict with a former ally. You may want to catch up on your DC titles to get the most out of this book. Batman #64 kicks off The Price, a four-issue crossover event with The Flash, and is also a Heroes in Crisis tie-in, taking place before the Knightmares storyline starts with Batman #61. This is a bit awkward from a narrative standpoint, interrupting the flow of the existing arc. Writer Joshua Williamson provides enough context clues to follow along, though, and does manage to tie the story to an earlier thread in King’s run. Williamson does an excellent job portraying the trauma and stress the character endures. Batman is beginning to suffer hallucinations, which Alfred writes off as sleep deprivation. Right from the first page, though, it’s clear the investigation at Sanctuary is affecting him. As Wonder Woman suggests, there’s more going on with Bruce’s mental state than fatigue. While some Justice League members crack jokes during their mission, Batman—and The Flash, for that matter—have little time for it. The contrast in mood underscores the toll their investigation is taking on the characters’ mental health. The only minor sticking point is that Bruce’s explanation for how he knew about the museum attack is a little vague on the details. Overall, though, the storytelling in Batman #64 is excellent stuff. The quality of the illustrations provided by Guillem March is superb from a technical standpoint. He fills the book with dynamic action shots, giving each page a tangible, kinetic sense. But, while the ink work is well-done, the frantic, relentless action sequences tends to make things feel chaotic. Panels throughout Batman #64 feel randomly placed, contributing to the choppy, hard-to-follow vibe. He allows key pages to slow down, using hashed lining to underscore the emotional weight of characters’ expressions. But the mostly-frantic pacing can be overwhelming. Colorist Tomeu Morey’s carefully-detailed work shines in this issue. He manages to keep pace with the intense action without losing sight of shading, contrasts, and other fine points, like the way he manages to capture subtle reflections of light on surfaces. Given it’s a tie-in, your feelings on Heroes in Crisis may influence how you read Batman #64. It’s a strong chapter in the story, though save for the last two pages, probably not essential if you’re not following HiC.